In 2003 writer Barbara Bayer, a correspondent for The Blood-Horse based in Japan, received an email asking her to help locate Ferdinand so his breeder could potentially buy him and bring him back to the U.S. After a disappointing breeding career in the States, Ferdinand had been sold to Japanese breeders in 1994 and sent to stand at stud in Hokkaido in Northern Japan. His career in Japan had also been lackluster and there may have been some effort to send him to a riding club to live out his days. In early 2001 Ferdinand was quietly sent to a horse dealer. Bayer contacted the dealer in 2003 and was told Ferdinand was “given to a friend.” When Bayer pushed to see the horse, the dealer admitted that Ferdinand had been “disposed of.” Bayer learned that Ferdinand’s Japanese registration had been annulled on September 1, 2002. 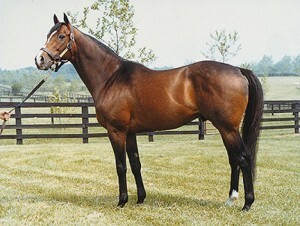 A longtime resident of Japan, Bayer knew that “disposed of” meant Ferdinand was most likely sent to a rendering facility, and because of Japanese cultural standards, the Derby winner was probably made into pet food. Bayer reported Ferdinand’s likely fate in The Blood-Horse, setting off a firestorm of controversy. The writer experienced backlash from the Japan Racing Association, but the JRA was roundly criticized on an international level. In response, the New York Thoroughbred Horsemen’s Association and the New York Racing Association worked together to create the Ferdinand Fee, a voluntary $2 starting fee that owners and trainers could pay to honor the Derby winner. The money is distributed to horse rescue and Thoroughbred re-training programs. Now, owners who sell accomplished stallions to Japan and other countries sometimes put “buy-back clauses” into the selling contracts to avoid a repeat of Ferdinand’s fate. The 1997 Kentucky Derby and Preakness Stakes winner Silver Charm has such a clause protecting him while he stands at stud in Japan. 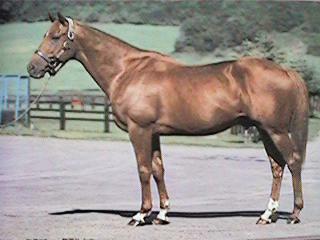 Exceller, who died in a Swedish slaughterhouse in 1997. Ferdinand’s loss gave momentum to horse rescues that were intially started in response to the 1997 slaughterhouse death in Sweden of Exceller, who’d beaten Triple Crown winners Seattle Slew and Affirmed in 1978. One of those rescues, Old Friends Equine, is a retirement farm in Kentucky run entirely on donations that specializes in rescuing Thoroughbred racehorses of distinction who’ve been “pensioned,” or retired due to lack of breeding value. It is currently the only rescue that will take stallions, which is part of their strategy. By keeping well-loved stallions on display for visitors, it increases Old Friends’ exposure and donations. Other nonprofits that focus on rescuing runners and re-training them for other purposes include Friends of Ferdinand, ReRun, CANTER, the Thoroughbred Adoption Network (whose mascot was a Ferdinand son until he was recently retired), and The Exceller Fund. Ferdinand’s and Exceller’s undignified deaths seemed to wake up Thoroughbred racing fans who now pay closer attention to their favorites sent abroad for breeding careers. By staying aware of stallions’ locations and breeding records, they can determine if a horse is likely to be pensioned and find investors willing to bring it back to the U.S. In addition to the increase of horse rescue and re-training programs, the fates of Ferdinand and Exceller have given fuel to the anti-horse-slaughter movement, resulting in the closure of all horse slaughter plants in the U.S. in 2007. (Horses are still shipped from the U.S. to Canada and Mexico for slaughter.) Descendants of the two stallions have also enjoyed growing interest from horse lovers who want to preserve and honor their bloodlines. 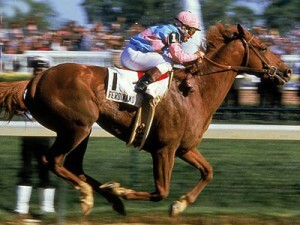 View one of Ferdinand’s finest moments below when he defeated another Kentucky Derby winner, Alysheba, in the 1987 Breeders’ Cup.